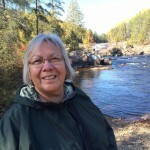 This blog was written by guest blogger Valerie Assinewe. This month’s calendar photo is of a Grizzly Bear in Kananaskis country. 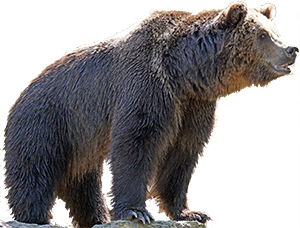 In myth, in Indigenous tradition and in popular culture, few mammals loom as large as this month’s featured species, the magnificent Grizzly Bear. Here is some information about this iconic animal. 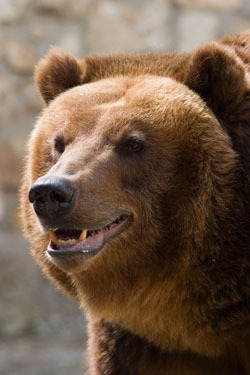 The Grizzly Bear (Ursus arctos horribilis), a subspecies of the brown bear, inhabits western Canada. One of the largest of living carnivores, Brown Bears are 1-3 m in length from head to rump. They are 90-150 cm tall at the shoulder and they range in weight from 80-600 kg. On average, adult males are 8-10% larger than females. An adult Grizzly Bear standing upright on its hind legs is roughly the height of a basketball net and can have the weight of a Toyota Corolla. Grizzly Bears are extremely strong and have good endurance; they can kill a cow with one blow, outrun a horse, outswim an Olympian and drag a dead elk uphill. During warmer months, Grizzly Bears eat a massive amount of food so they can live off body fat during the winter. They may consume 40 kg of food each day, gaining over 1 kg/day of body weight. 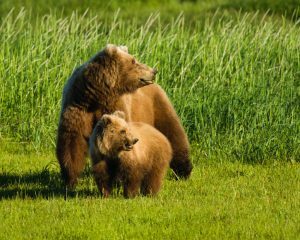 As omnivores, grizzlies will eat anything nutritious they can find, gorging on nuts, fruit, leaves, roots, fungi, insects and a variety of animals including salmon and other fish, rodents, sheep and elk. Their diet varies depending on what foods are available for the season, and consequently they will eat domestic animals, carrion and garbage. In the fall, as temperatures cool and food becomes scarcer, grizzlies dig dens in the sides of hills. The bears settle in their dens to hibernate for the winter. This deep sleep allows the grizzlies to conserve energy. Their heart rate slows from 40 beats/min to 8; and in case you’re wondering, they do not defecate or urinate during hibernation. Female bears have their first young when they are 5-7 years old, and typically have litters of 1-3 cubs. The young are born during January or February inside the overwintering den. At birth, the cubs are less than 22 cm long and weigh about 400 g. They gain weight rapidly and weigh about 8 kg when they emerge in the spring. The cubs learn from their mothers and stay with them for 2-4 years. As a result, female bears are only able to reproduce every three or four years. Grizzly Bears live an average of 20 years, although individuals as old as 34 have been recorded. It is not as simple as a black versus brown: hair colour is, in fact, the least reliable identifier. “Black” Bears can be black, blue-black, dark brown, brown, cinnamon or even white. Grizzly Bears, likewise, may range in colour, from black to blond. Similarly, size is also not a reliable identifier even though Grizzly Bears are, on average, significantly larger than Black Bears. Size varies with the age of the animal and the season. Grizzly Bears have a pronounced shoulder hump, which the Black Bear lacks. Grizzly Bears have a concave or “dished” facial profile, whereas Black Bears have a straight face profile. Grizzly Bears have smaller, more rounded ears. Black Bears have larger, longer, more erect, and pointed ears. The Grizzly Bear have much larger claws than the Black Bear: 5-10 cm compared to 3.8 cm front claws, respectively. As people and the Grizzly Bear interact more, remember that the bear will only attack if cornered, wounded or protecting their cubs. Wildlife officials advise that the best way to avoid a bear encounter is to make noise while hiking and carry bear spray. Habitat loss due to logging, development and mining has affected the Grizzly Bear in northwestern United States, and as a result, the Grizzly Bear is listed as threatened in the U.S.A. In Canada, human activity is also affecting the grizzly population. You can do your part by contributing to efforts to protect the habitat of Grizzly Bears, and through your ongoing and valued support to the many conservation initiatives of Nature Canada. Winter 2018 Is The Time To See Some Snowy Owls!